When it debuted in 1975, the Triumph TR7 was marketed as “the shape of things to come”, which, incidentally, is also the title of an H. G. Wells book establishing a world state as the solution to humanity’s problems. Both were a pretty dramatic change from the past – in the case of the British sports car, it was going from a traditional roadster with its roots in the 1960s to a modern car that often fails to get attention nowadays because it was indeed what its tagline predicted. Much more successful, common cars like the Mazda RX-7, any front-engine Porsche sportscar, and the eighties Nissan Z-cars were all wedges, which makes the TR7 seem less radical these days. Despite being panned among car enthusiasts (partly well-deserved due to the build quality of the early cars), they sold quite well and are very usable as a modern classic. There were several variations of the wedge body, and we have two for today. 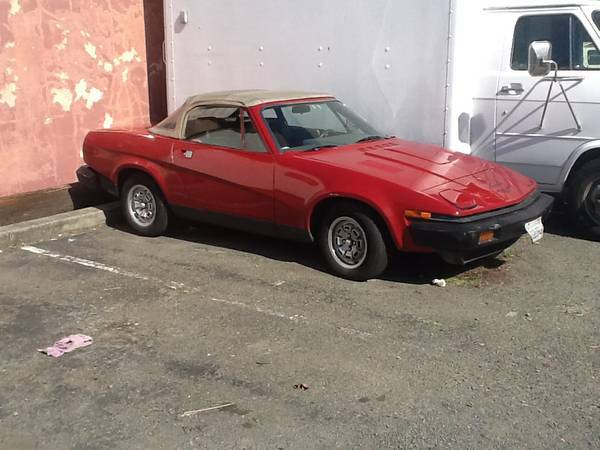 Check out this 1980 Triumph TR7 for sale for $3000 in San Rafael, CA. Gee mister, that red paint sure is shiny! At least they retained the adhesive Triumph logo on the front, but the red vent window frame doesn’t seem right. The interior looks to have its original upholstery, and the TR8-style wheels are a nice touch. Apparently, British-spec higher compression pistons give a little more power – can one still sneak through smog testing with those? Home market cars were capable of a respectable 100hp. This particular car has a newly rebuilt engine, and new fuel pump and starter, along with tires that are said to be good. It still needs distributor parts, which must mean a whole distributor – why would you go so far into a car and not do points, cap, and rotor? Debris under the car suggests it’s been sitting for a while, so plan on some resurrection work. Dual SU carburetors running through a bunch of primitive emissions equipment not clean enough for you? 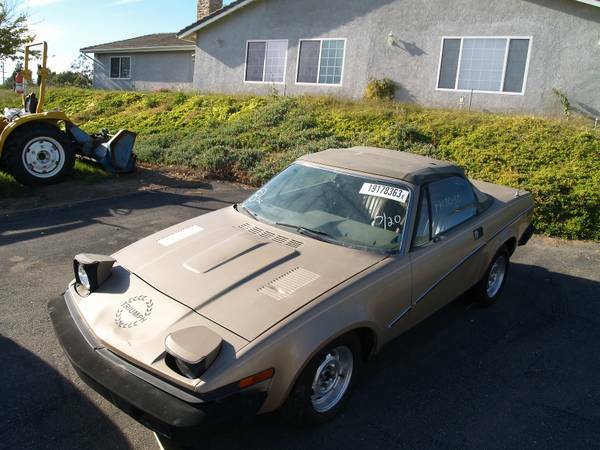 For you, my friend, we have special car – check out this 1980 Triumph TR7 for sale for $1650 in Ramona, CA. Only a few hundred fuel injected cars were built, and while they don’t have the level of power you might hope for from a 2-liter four-cylinder, they still benefit from improved driveability. This particular car is being touted as a BARN FIND!!!! !, so where’s the hay? The chicken poop? The dust? It does look to be in decent cosmetic condition, and with only 77,000 miles, perhaps you’ll get lucky and have a weekend driver for the cost of some troubleshooting and maintenance catch-up. TR7s got favorable reviews from the press at their debut, which is pretty respectable given what Triumph was up against – would you give their last gasp a second thought? This entry was posted on May 9, 2014 at 11:32 am and is filed under Feature. You can follow any responses to this entry through the RSS 2.0 feed. You can leave a response, or trackback from your own site. those are dealer auction markings and decals on that second car’s windshield, so I doubt the barn find statements veracity.